Durango photographer Claude Steelman hangs one of his photos inside Wild Shots, his Main Avenue gallery that opened in late 2010. Maximizing a small space, Steelmans framed photos cover the walls of Wild Shots and the bins are full of prints. If you love horses, Colorado, wildlife and nature, you probably are familiar with the work of photographer Claude Steelman. You also might know the Durango resident from his work at Open Shutter Gallery or from his five books of photographs, the most recent being Wildshots  The Photography Of Claude Steelman. 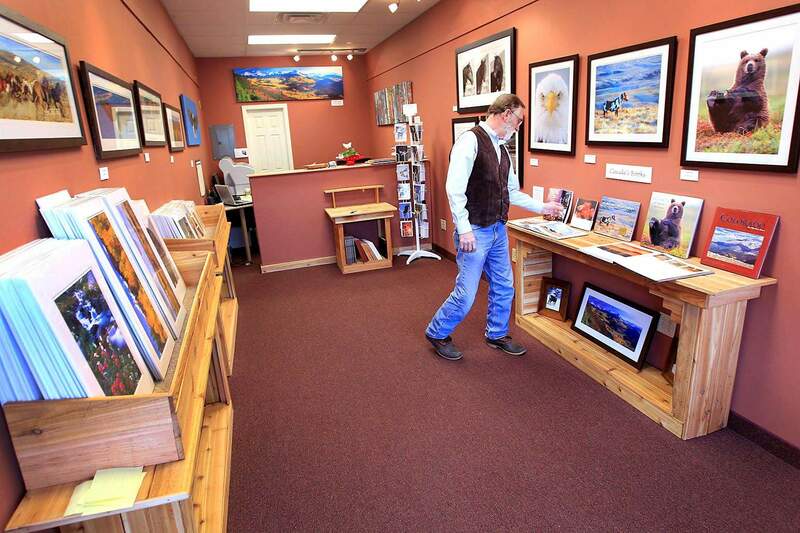 Now, having recently established Wild Shots Gallery at 730 Main Ave., he can add gallery owner to his résumé. 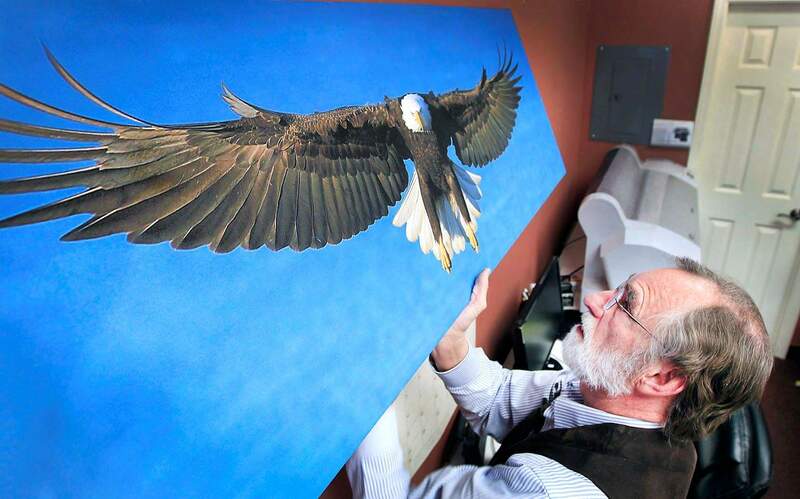 Noted for his love of wild mustangs (he owns two) and his photographic homage to their free spirit, Steelmans work also graces the tail sections of three Frontier Airlines planes; a shot of a hummingbird and columbine, a raccoon and a sea otter. He also was the featured artist at 2010 Home & Ranch Show. Its an impressive history for any self-taught artist, which he is. While a comparison to landscape and nature photographers John Fielder and Thomas Mangelson is almost inevitable, Steelman brings his own point of view and vision to capturing the outdoors on film (though he and Mangelson have worked together in the field). Steelmans photos have been featured in numerous publications, including Field & Stream, National Geographic World, and Smithsonian Magazine. In addition, documentary films he has shot have been seen on The Discovery Channel, PBS and National Geographic Channel. Working mostly with a Nikon digital camera, Steelman produces imagery that embodies the splendor and diversity of nature at its most serene or animal and sea life that few of us get to experience up close. At Wild Shots you can thumb through rustic, handmade wooden bins containing matted shots of varying sizes and subjects. Within the array you might come across a close-up of a bald eagle; a staring black wolf; grizzly, black and polar bears; an underwater trout; a vivid field of wildflowers under of snowcapped mountains; elk; moose; and coyote. On the walls are framed versions of his work along with his iconic signature black-and-white image of a Wyoming mustang. This particular image encapsulates the free spirit of a wild stallion, its wind-blown mane looking like that of a long-haired woman riding in a convertible with the top down. Though not all at the gallery, Steelman believes he has more than 100,000 photos on file. In most cases, he produces a large-enough number of prints to keep the cost of owning one to less than $1,000; and some of the small matted prints are only $15. His largest prints are horizontal landscapes measuring 2 feet-by-almost 6 feet in length. As glamorous as the life of a wildlife photographer might sound, Steelman puts forth a stalwart effort to get shots most people never would consider attempting. The lone wolf photograph taken in Yellowstones Lamar Valley, for instance, was the result of 12 days of patiently waiting in sub-zero weather to have only six seconds of opportunity. The wolf just looked at me as he walked by, nonthreatened and nonthreatening, he recalled. Like most of his work, the resulting portrait is awe-inspiring. Gallery visitors can find one or all of his books that memorialize the feeling one had the first time he or she saw Colorados magnificent surroundings  when they stood and stared at the landscape and its wildlife in wonderment. But Steelman has not confined his lens to Colorado alone. He ventures into the snowfields of Alaska and the Pacific Northwest; he has spent time trekking through the canyons of the Southwest and over desert sand dunes; he hikes up mountains and next to streams; he shoots above ground and below the waters surface; and vicariously brings to lesser mortals the thrill of discovery, the enchantment of nature, and the freedom of the wild.